An ethnic joke is a remark attempting humor relating to an ethnic, racial or cultural group, often referring to an ethnic stereotype of the group in question for its punchline. Perceptions of ethnic jokes are ambivalent. Many find them racist and offensive. On the other hand, jokes poking fun at one's own ethnicity are sometimes considered acceptable but Christie Davies challenges this notion of there being an innocuous ethnic joke. Davis maintains that ethnic jokes reinforce ethnic stereotypes and sometimes lead to calls for violence. The perceived damage to the ethnic group can be of great concern as when the ethnic Polish jokes became so common in the 1970s the Polish Ministry of Foreign Affairs approached the U.S. State Department to complain. The predominant and most widely known theory of ethnic humor attempts to discover social regularities in the anecdote traditions of different countries by contextually describing jokes. Professor Christie Davies, author of this theory, has posed the main arguments in his article Ethnic Jokes, Moral Values and Social Boundaries, published in 1982. His approach is based on Victor Raskin's (1985) Semantic Script Theory of Humor, or to be more precise, on the arguments connected with ethnic humor on binary oppositions. While Raskin merely describes the main binary oppositions providing examples (mostly from the Jewish humor), Davies explores the situations where the scripts apply; for example, he has discovered that the most common opposition, stupid/clever, is applied under particular circumstances in the social reality of two ethnic groups concerned. Davies in his monograph published in 1990 has surmised that "Jokes in every country (or reasonably homogeneous cultural and linguistic domain) have certain targets for stupidity jokes – people who dwell on the edge of that nation or domain and who are perceived as culturally ambiguous by the dominant people of the center. In addition, they will likely be rustic people or immigrants in search of unskilled and low-prestige manual work. They are to a great extent similar to the joke-tellers themselves, share the same cultural background or even speak a similar or identical language." According to Davies, ethnic jokes are centered on the three main themes of stupidity, canniness and sexual behavior. Davies is featured in the 2010 documentary film, Polack, exploring the source of the Polish joke. L Perry Curtis in examining ethnic humour aimed at the Irish in Victorian England describes the descent that the ethnic joke and the accompanying stereotype can undergo as the target that they are aimed at descends into depictions of violent behaviour: "My curiosity of 'Paddy's' transformation in comic art from a rather primitive, rustic, or simple-minded peasant to a degenerate man...bent on murder or outrage." 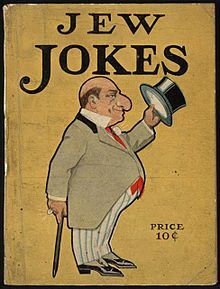 Nevertheless, according to Samuel Schmidt, the ethnic jokes can also be a form of social resistance, and so they are addressed by the joke-tellers against those whom they see as the aggressors, like the multiple jokes published in Mexico about the Americans (also called gringos there). ^ Berger, Arthur Asa. An Anatomy of Humor. ISBN 9781412817158. ^ Dominic Pulera, "Sharing the Dream: White Males in Multicultural America". p 99. ^ Seriously Funny: Mexican Political Jokes as Social Resistance. University of Arizona Press. 2014-03-06. ISBN 9780816530779. Davies, Christie (1990). Ethnic Humor Around the World. Indiana University Press. ISBN 0-253-31655-3. Draitser, Emil (1998). Taking Penguins to the Movies: Ethnic Humor in Russia. Wayne State University Press. ISBN 0-8143-2327-8. Jaret, Charles (2002). "Book review: The Mirth of Nations". American Journal of Sociology. 108 (6): 1426. doi:10.1086/380540. Rappoport, Leon (2005). Punchlines: The Case for Racial, Ethnic, and Gender Humor. Greenwood Publishing Group. ISBN 9780275987640. Mitchell, Henry (June 24, 1991). "Did You Hear the One About..." National Review. Berger, Arthur Asa (1999). An Anatomy of Humor. Transaction Publishers. ISBN 0-765-80494-8. This page was last edited on 2 April 2019, at 01:40 (UTC).